E.S.H. El Ashry and Y. El Kilany, Acyclonucleosides, Part II. B.B. Lohray and V. Bhushan, 1, 3, 2-Dioxathiolane Oxides: Epoxide Equivalents and Versatile Synthons. F.A. Abu-Shanab, B.J. Wakefield, and M.H. Elnagdi, Methylpyridines and Other Methylazines as Precursors to Bicycles and Polycycles. M.A.E. Shaban and A.Z. Nasr, The Chemistry of C-Nucleosides and Their Analogs I: C-Nucleosides of Hetero Monocyclic Bases. The first chapter in this volume, by E.S.H. El-Ashry, represents the second part of a trilogy on nucleosides he began in Volume 67. This chapter deals with diseco-nucleosides, or analogs of nucleosides in which thereare two bond disconnections. 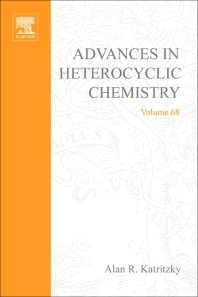 Other chapters deal with the importance of cyclic sulfates as intermediates in organic synthesis, methlypyridines and other methylazines as precursors to biand polyheterocycles, and the variety of heterocycles in nucleoside analogs in heteromonocyclic bases.